Vitamin D and calcium aid in bone growth and remodeling, and are essential for proper functioning of the heart, nerves and muscles. When people lack adequate amounts of these nutrients, it may be due to the body's inability to absorb the vitamins, nutritional deficiencies or a medical problem that interferes with absorption of these vitamins. Significant deficiencies of these two nutrients can lead to serious health problems. Before supplementing a diet with vitamin D or calcium, consult a health care professional about proper dosages for the situation. Rickets and osteomalacia are two of the most common conditions associated with a vitamin D deficiency. Rickets is a condition that occurs in children who don't get enough of the vitamin. The National Institutes of Health Office of Dietary Supplements describes rickets as a condition in which bones don't mineralize properly, leading to skeletal deformities and soft bones. Symptoms include impaired growth, bone pain and skeletal deformities. Osteomalacia is a result of vitamin D deficiency in adults, and leads to weak bones and muscles. Common symptoms include bone fractures, widespread pain and muscle pain. This condition may not produce symptoms until significant damage has been done. A deficiency of vitamin D causes hypercalcemia, according to the Merck Manual. This causes the body to produce an excess of PTH, or parathyroid hormone, which causes hyperparathyroidism. Hyperparathyroidism increases absorption and kidney conservation of calcium but also increases the amount of phosphate excreted by the body, says the Merck Manual. This increased phosphate excretion interferes with bone mineralization, which can cause weakened bones and bone pain. Other symptoms include abdominal pain, seizures and numbness in fingers, toes and around the mouth. People with high blood pressure may not be getting enough calcium. The University of Maryland Medical Center says people with a calcium deficiency may be at higher risk of developing hypertension, and increasing calcium intake may help lower blood pressure. More studies need to be done, as there are conflicting results. If you have high blood pressure, consult a health care professional about the possible benefits calcium may have for them before taking calcium for this purpose. High blood pressure may not have any symptoms. Some people may experience headaches, nose bleeds or changes in vision. 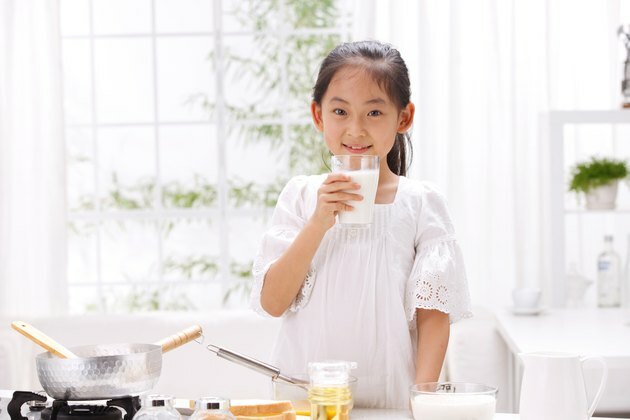 Calcium is essential for healthy and strong bones, and a deficiency of calcium can lead to an increased risk of osteoporosis, fractures and weakened bones. Vitamin D helps the body absorb and use calcium, and a deficiency with vitamin D decreases the body's ability to do so. Taking calcium supplements can help reduce the risk of developing osteoporosis after menopause for women, and in men it can help prevent bone loss that occurs with age. Several other signs and symptoms may be present with a vitamin D or calcium deficiency that could be easily mistaken for other causes. The Merck Manual lists other symptoms of a vitamin D deficiency as including muscle aches and weakness and bone pain. A calcium deficiency can cause similar symptoms, including muscle cramping and irritation, eye twitching, headaches and jaw pain, says the Health Supplements Nutritional Guide. If you experience these symptoms, a health care professional can help determine the underlying cause. Can Vitamin D Deficiency Cause Muscle Cramps Fasciculation?